As a payment processing integration partner for utilities nationwide, we see the importance of this addition to any utility provider’s customers. Utilities must be able to offer fast, secure ways for customers to pay their bills online. With Singular BillPAY, utility software solutions can allow customers to set up recurring payments, safely store cards and ACH on file with built-in tokenization and most importantly – the payments integration removes the utility software provider from the PCI scope requirements associated with processing payments inside their software. This important distinction is what makes our PayFac API integration for utilities a win-win. 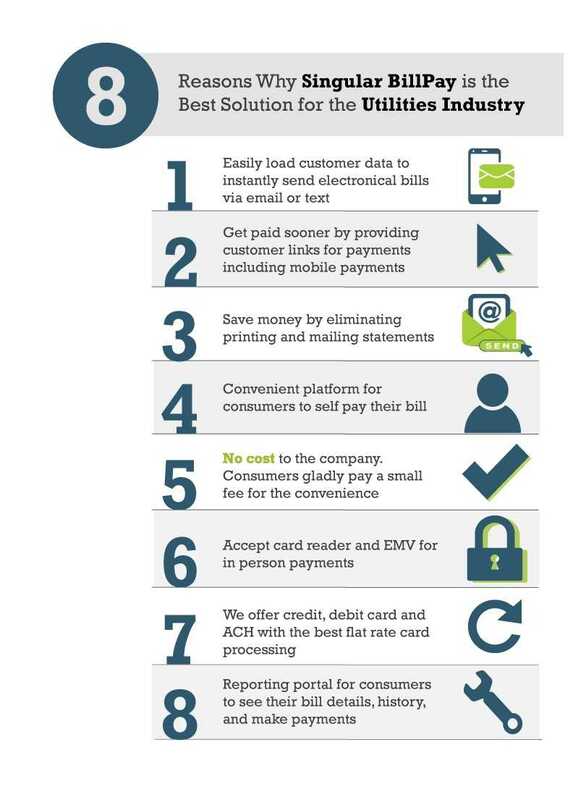 Ability to use bill data for each customer to send invoice notifications electronically (email or text) along with a link to make a payment online. This feature helps to reduce the exorbitant hard and soft costs of sending bills by mail! Ability for customer to easily self-pay and securely store their favorite payment options/card on file or ACH on file for next time. Utilities can charge convenience fees to customers to help offset the cost of payment acceptance. Utility providers can get a card reader or EMV terminal for “drive-up” payments made at the window or “walk-in” payments made at the counter. Competitive, flat rate credit, debit card, and ACH pricing. Intuitive, user-friendly reporting portal for customers to see their bill details, transaction history and make payments. Utilities can also set up their integration with all the bells and whistles they want from our extensive API library to build their perfect payments integration solution. Ready to bring your customer billing and payment collections into the 21st Century? Get the conversation started today by requesting a consultation on our website. And keep in touch by subscribing to our blog!